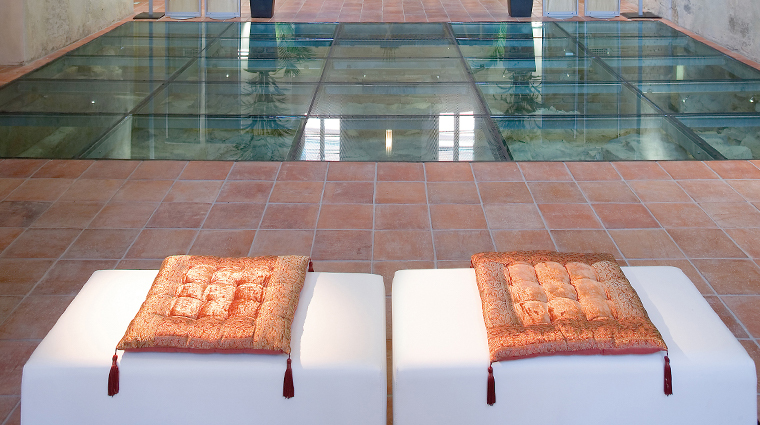 The moment you set foot inside The Spa at Mandarin Oriental, Prague, you know you’re in for a relaxing stay. Set within a Renaissance chapel — with the remains of an even older church below your feet — the space’s illuminated stone walls, arches and frescoes give an immediate sense of serenity. The two-floor spa makes the most of its unusual setting, too. Each of the seven treatment rooms offers high vaulted ceilings and historic features, while soft bathrobes and slippers, warming herbal teas and soothing water treatments add to the ethereal tranquility. And that’s all before you experience any of the therapeutic treatments, inspired by everything from traditional Chinese medicine to Czech linden trees. City-center spas don’t get any more peaceful than this. 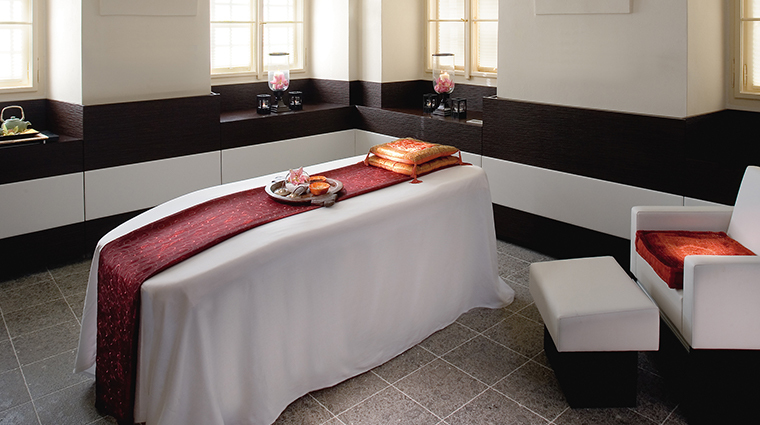 The Spa at Mandarin Oriental, Prague’s centuries-old monastic heritage is carefully preserved within a contemporary, minimalist design that feels cozy rather than stark. In the lobby, look down to see the original stone foundations of the 14th-century Gothic church. The ceiling and fresco-covered walls remain from the later Renaissance chapel. Along with the Mandarin Oriental’s signature Aromatherapy Associates products, this Prague spa also uses Mcely Bouquet’s line of natural and organic skincare to enhance certain treatments. Each service starts and ends with a long ringing of the Tibetan tingsha, a set of two small, ornate cymbals that have been used for centuries in Buddhist prayers and rituals. Despite its location just off the bustling and tram-filled Ujezd street, this luxury spa is wonderfully silent. Thank the Dominican monks who constructed the thick stone walls. Due to the historic nature of the building, there is no pool. However, there are steam showers, small vitality pools and other heat and water treatments in each room. 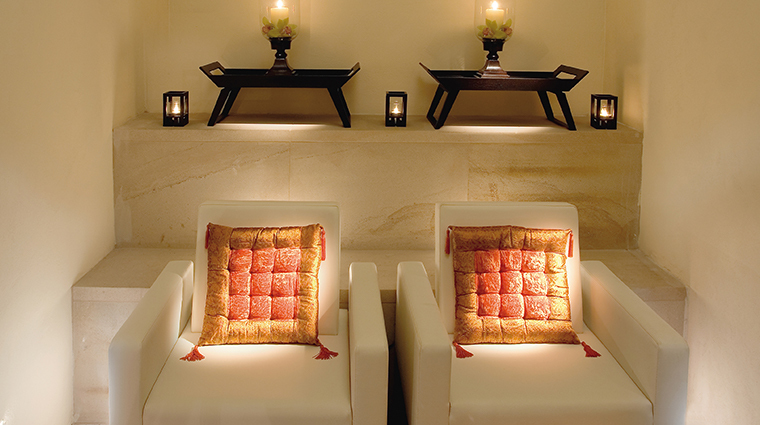 For Mandarin Oriental hotel guests, an underground hallway offers discreet direct access to the spa. Look in the alcoves for archaeological finds dug up during the passage’s construction. For most the 19th and 20th centuries (after it was a church, but before it was a spa), this building was a printing house. The city’s first newspaper, Prager Tagblatt, was printed here. The spa and its luxe facilities can only be used by those over the age of 18. For a different approach to a spa treatment, try a Time Ritual. This Mandarin Oriental innovation involves booking a set amount of time, rather than specific treatments, so the therapist can tailor a series of services to suit your individual needs. 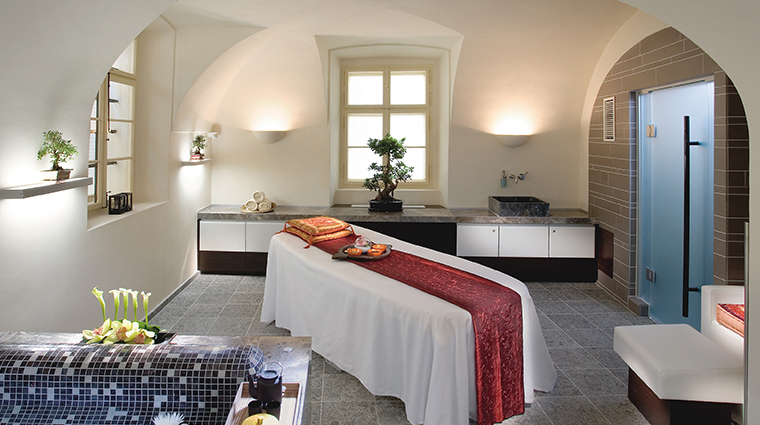 Try a quintessential Prague spa treatment with the Linden Embrace. Inspired by the Czech national tree, whose heart-shaped leaves are believed to be good for cardiac health, the service starts with tea and includes a full-body scrub and holistic massage. The Digital Wellness Escape is designed to ease the strains resulting from staring at screens all day, focusing on the head, eyes, neck, shoulders, hands and feet. Feeling decadent? The Oriental Indulgence is a four-hour whole-body treatment featuring a foot ritual, a body scrub, an essence massage, an aromatherapy facial and a bento box meal. There are seven different treatment rooms in this luxury spa, each with vaulted ceilings and a range of private heat and water experiences, from steam showers to vitality pools. Before and after your treatment, you can relax in the tea lounge, enjoying a selection of herbal sips while listening to soft music. We recommend the mint tea with a spoonful of honey. This Prague spa also features a state-of-the-art fitness center complete with Technogym treadmills, cross trainers, bikes, rowing machines and weights. There are also personal trainers and yogis available — or join the Prague Harriers CZ running club for some outdoor exercise.